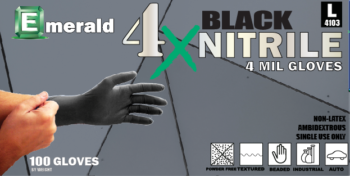 Emerald 4X Black nitrile powder-free gloves are an economical alternative for users requiring a general purpose glove that needs frequent changing. Perfect for automotive, janitorial, and painting applications, their black color won’t show grease, grime or dirt. They can also be used for food service as they are made from component materials that fully comply with FDA regulations regarding food contact. Emerald 4X Black nitrile gloves have a beaded cuff to facilitate donning and a textured finish to provide a non-slip grip under wet or dry conditions.